Ahhh...I love peaceful evenings at home. I have a candle burning, the children are in bed and it is snowing/sleeting outside...but nice and warm in our house thanks to our NEW furnace!! And, thanks to daylight savings time, it is dark out. During the summer months we are usually out on a long evening walk about this time. But, not tonight!!! Do you ever find yourself wanting to write something down but it is too dark to see? I have that problem...not frequently, but enough! I have a perfect solution!! I have received a neat little gadget that is sure to make someone on your Christmas list VERY happy! This is something that I have seen before but have never owned. I used to do alot of camping before I was married and I can really see the usefulness of this next review item!!! I have been sent a double LED Pen-Light to review and it is really cool! I pulled it out of the box and noticed that it can be used with the cap ON. There is a window in the end of the cap that allows the light to shine out...kind of like a flashlight (although it does not shine very far LIKE a flashlight does). It is basically for writing and using in close proximity to a surface. All you do is twist the end to turn the light on and off. Writing when your spouse is sleeping and you don't want to wake them. You can put it just about anywhere too...nightstand, glove box, next to the telephone, in your pocket, etc. It is so compact and lightweight, it can go with you wherever you happen to be going! This nifty Pen-Light lasts up to 300,000 hours and comes with fresh batteries already installed, which is GREAT! It is also environmentally friendly because it consumes very little energy and is refillable. I particularly liked the fine-tipped pen as it wrote very nicely. Also, as an added great customer service benefit these lights are 100% guaranteed...if you don't like your Pen-Light you can return it within 60 days and either get it replaced or get refunded. I personally LOVE 100% guarantees as it shows the company's confidence in their product. 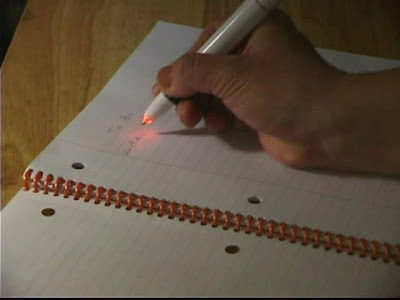 So, in my opinion...I was not terribly impressed, but think that this LED Pen-Light is pretty neat. It would make a great stocking stuffer for that person on your list who has everything (like my dad...LOL!). Mandatory Entry:Tell me what you would find helpful about this pen light. You do not have to be a blogger to enter, but you must leave a valid email where you can be reached should you win. If you do not leave an email address, it must be where I can easily find it. This giveaway is open to US residents and will end 12/17 at 11:59 pm EST. The winner will be chosen using random.org and will be notified by email. The winner will have 48 hours to respond, or another winner will be selected. Disclaimer: I received no monetary compensation for this post. I did receive a LED Pen-Light for review purposes All quotes are from the Pen-Light website and email. All thoughts and opinions are mine. I could use this to make notes at night when all the lights are already off. This seems like the idea pen to have in the glove compartment! This would be great to write stuff to remember when I watch tv at night. how wonderful for those things you think of just before you fall asleep! I love the write stuff down and sometimes it will be right before I go to bed and instead of cutting the light on and waking up my husband I can just use this. This would be handy for those middle of the night calls. I used it when we are traveling at night in the car. this would be helpful when i am laying down in bed and remember something that i have to do the next day- i can just write it down instead of hoping i will remember it again. Sometimes we have campouts in the living room and when the kids are asleep getting any work done with the lights off is impossible! This would be very helpful. It would be great to keep in the car and when I need to write something in the dark I wouldn't have to turn on the lights.